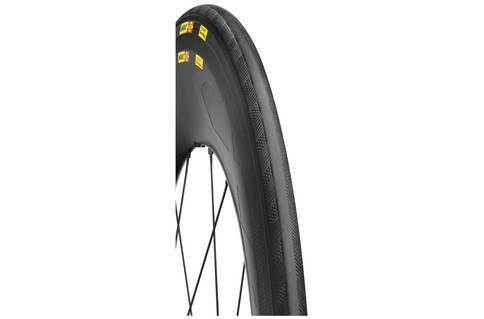 The Mavic CXR Ultimate is the kind of wheelset that you get hooked on from the very first ride. This is because there is so much going on behind the scenes to offer up a truly great ride. Aerodynamics notwithstanding, there is a lot to appreciate about the CXR Ultimate. If your first instinct is to read the specs on the Mavic CXR Ultimate, you are going to be solely disappointed. This is because this wheelset weighs in at just over 1800g – and this is without the tires! Once you consider this controversial fact, it can be impossible to see this wheelset competing in a time trial race. Well, the beauty of the CXR Ultimate is that it does not rely upon lightweight rims to get you across that finish line. Instead, it focuses all its efforts on the aerodynamic components of the wheelset. The first is the Blade system. This has been implemented to help reduce the amount of aerodynamic drag experienced by the wheelset. One of the things that you certainly cannot deny about the CXR Ultimate is the quality that you get for the price that you pay. Every aspect of this wheelset has been manufactured with care and quality in mind. What I was also quite heartened to see on this wheelset were the Exalith II brake pads. This is a patented design from Mavic and is used to much avail. What I particularly like about these brake pads is that they are good for all types of weather. Dry or wet, you get the same amount of stopping power every time. The CXR Ultimate performs best on the flat ground although, with a little bit of effort, you could probably pull yourself up a steep hill or two. The Mavic CXR Ultimate may not be breaking any records for lightness but it does perform admirably as an aero bike. Pricey and slightly hefty, the CXR Ultimate may not be anyone’s first choice, but it really should be.